Often I imagine being the writer / speaker / blogger who brings light-hearted laughter and sigh-giving release from the tensions of life. I at times secretly wish for that platform, and yet it seems that God has called me to something a little different. Not better, not worse, but different. I am compelled, passionate, perhaps “called” to remind us all that to reach to “the joy set before us” like Jesus we must endure some costly trials – some that require tears or blood or life. So in this post, I encourage us all to engage joyfully in caring deeply for our hurting brothers and sisters. Recently, students on a Kenyan college campus gathered before classes began. Suddenly terrorists burst onto the campus, spraying gunfire, pulling individual students and shouting, “Are you a Christian?” Those who claimed to follow Christ were instantly killed for their faith (147 total). Muslim lives were spared. Persecution of Christians has been around since the time of Stephen, the early church leader. Jesus told us that his followers would be persecuted (John 15:18-25). The first disciples gave their lives for Christ. Through the years, gallons of blood have been spilled for claiming the Name of Christ. But in the recent days, the blood of martyrs is filling the earth faster and in great quantity. Yet as blood pours out, our nation’s political leadership and the US media barely mention the crimes against Christians. These killings of Christians will continue because Satan hates Jesus and His followers, and Jesus has prophesied it. I realize that a government’s job is to protect and defend a nation’s people, regardless of religion (not to simply defend Christians). But certainly the Church should demonstrate deep emotion, heartfelt passion, and activated concern for our brothers and sisters. As persecution increases, I ask myself often if my heart is dull or sensitive for the faith. And if I am dull, what can I do? If the beheading of believers does not cause every local church to stop when its members gather to intercede, what will? If the increase in terrorist groups’ evil actions does not cause us to realize we need prayerful strategies to help release Muslims from the grasp of demonic principalities, what will? If we are not moved to prayer and action when we hear of the barbaric acts happening to Christians, it may indicate our faith is diseased, decaying, inward … or false. Maybe we need to pause our pontificating and get on our knees. Maybe we need to halt our flurry of activities and model sacrificial prayer. Maybe we need to silence the singing for a time and sit in reverent silence to remember and honor brothers and sisters and prepare our own hearts to stand for Jesus. I ask myself – if I do not know how to mourn deeply, can I truly celebrate in my walk with Christ? The full range of emotions are needed and move our gatherings or lives to sacred spaces of worship. I really believe if the Church models the intentionality to pray for the persecuted, Christian families may also realize the importance and pray as families. But how can the deeper conversations take place that prepare people’s hearts for life’s trials? The actions of the church model for families what is important/not important. The actions of parents model for children what is important/not important. So how can se improve our examples and move to deeper levels as God’s people? 1. Realize Jesus expects the Church to be a house of prayer for all nations. Jesus cleared the prayer area reserved for the Gentiles when he drove the money changers out of the temple (see Mark 11). Would God want to push anything away in our churches that prevent us from seeing and hearing and responding to the cries of our sisters, our brothers, and lost people? How can a church do this? Every time a local congregation meets, there should be prayer for the nations and prayer for the persecuted. It doesn’t have to be long or drawn-out. The believers who pray or speak should model from the platform what it looks like to have concern for people outside the church. Satan wants to limit the people, the time, the topics of prayer! But, having a heart for the nations and for the persecuted is everyone’s responsibility – not just the mission committee, not just the prayer team, not just during mission week. Church leadership should model it in the worship, the prayers, and the preaching/teaching. Sunday School classes and small groups should also pray for our sisters and brothers who struggle around the world each time they meet. May they declare Christ’s message boldly. Chad and I also lead Concerts of Prayer at times in churches that enable a church to incorporate worship, intercession, Scripture, and stories into a concentrated time of prayer. The time flies, and hundreds of hours of prayer are released. (If the concert is 1 hour in length and fifty people show up, 50 hours of prayer are released into the Islamic world, for example). Contact me if you are interested in learning more. 2. Encourage your children to care for people they cannot see. When we put our kids to bed or when we pray at a meal (if the kids are not praying), our kids hear us pray for kids in Syria, China, Nigeria, etc. They hear us ask God to provide food for the Kurds or the Yazidis of Iraq. At times we encourage our daughter to pray for all the girls her age in a nation or our son to pray for all the boys in the nation his age. Kids need to see their parents show concern for kids beyond their family! I truly believe not only does a child learn to pray, but they also realize they are not the center of the world – Jesus Christ is! And Jesus cares for all the kids of the world – their food, their water, their health, their safety, their forgiveness, and their purpose. 3. Discover ways to implement global prayer into your own life. There are so many resources out there. We try to pray at 10:40 every morning for unreached people groups (my husband goes so far as to set his watch; that way when his watch annoys everyone, and he can encourage them to pray for the nations!). I subscribe to the Joshua Project prayer list and each day I receive an email with an unreached people group. When you hear news about persecuted brothers and sisters, don’t turn away, or ignore it, or immediately click on a new story to read. READ it, absorb it, mourn over it, and pray that God will use it mightily to defeat demonic principalities that hold so many captive. The writer of Hebrews encourages us to “Continue to remember those in prison as if you were together with them in prison, and those who are mistreated as if you yourselves were suffering” (Hebrews 13:3). So are you, your family, and your church remembering those suffering for the Name of Christ as if you were the one being terrorized by ISIS, as if your child was at risk of death, or as if your daughter had been kidnapped and forced into marriage – all because of their faith? If not, then we as believers of the Way need to allow the Holy Spirit to prompt, to deepen, and to refocus us. Our brothers and sisters are standing up for their faith? 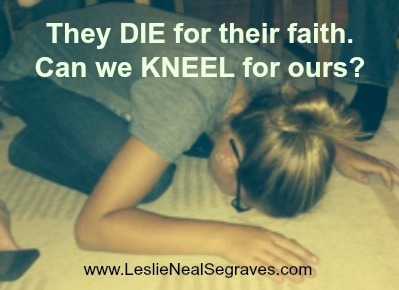 Can we kneel for ours? Join the Conversation: I would love to hear how your church or family is praying for our persecuted brothers and sisters.